Recently David Robertson, Moderator of the Free Church of Scotland, delivered a Christmas message where he said society was becoming a monochrome culture where genuine diversity was being undermined by a “mob mentality which threatens anyone who dares to be against the ‘equality and diversity’ agenda” . His address was treated to considerable negative comments, illustrating the very point he was trying to make . One newspaper headline put it “Twitter mob puts free speech in peril” . The point David Robertson was making is that it is now very hard for Christians to express their views in the public sphere as the climate has shifted to a liberal humanist position that denies core Christian beliefs, values and morality . As the balance of beliefs has shifted those opposed to Christianity find it easier to express their views, often in quite hostile tones. I think anyone who has observed the changes in political correctness over the years will have noticed this trend. What was unacceptable in the past is acceptable now and vice versa. Essentially there are two competing ideologies: the Christian one of the past, and the Humanist one now . What David Robertson has described in his message is an example of a System Dynamics archetype called “Success to the Successful” . Consider two competing opinions 1 and 2. 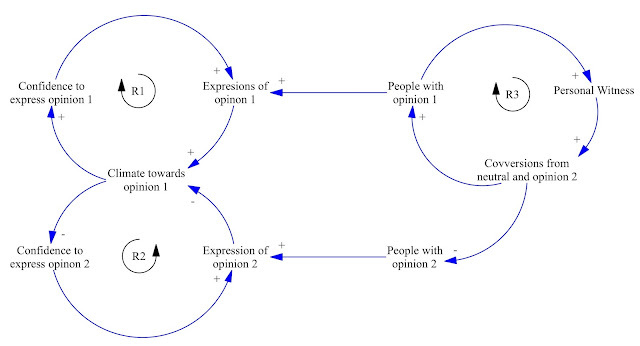 The number of people who hold opinion 1 will influence the amount of expression of opinion 1, top right in the “casual loop” diagram below. The more people, the more expression – the plus on the arrow means “change the same way”, i.e. “more” in this case. 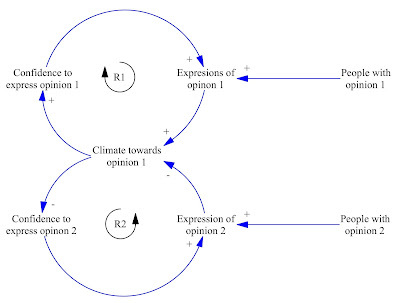 The more expression of opinion 1 the more the climate of society favours opinion 1. The better the climate for opinion 1 the more confidence people have in expressing the opinion. The greater the confidence the more opinions expressed. This is the reinforcing feedback loop R1 in the diagram. On its own reinforcing feedback will give accelerating growth, limited only by the physical ability and need to express opinions. Without any competitors society favours opinion 1. However if there is a competing opinion, number 2, then there is now a parallel structure, except that this one moves the climate away from 1, towards 2. The more expression of opinion 2 the less the climate of society favours 1 – the minus on the arrow. 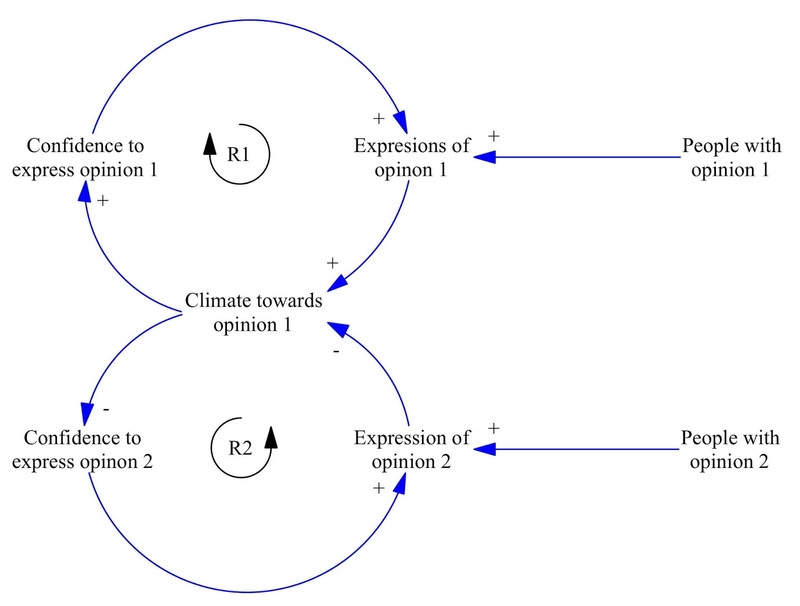 If the climate now favours 1 less then there will be more confidence in expressing opinion 2 – the minus sign means the change is the opposite way to the cause. This gives a second reinforcing feedback loop R2. Let’s say opinion 1 is Christian and opinion 2 is Humanist. While Christianity was strong in society loop R1 was dominant and loop R2 would make little effect, keeping humanism as a small non-influential minority. The essence of the success to the successful archetype is the one side excludes the other; there is no healthy coexistence, but competitive exclusion. However two things have happened over the years. Firstly, as churches have got weaker and declined, the number of Christians, those holding opinion 1, top right hand corner of the above diagram, has declined, thus the link to expressions of opinion 1, the Christian opinions, has declined weakening R1. Secondly those sympathetic to the humanist position have been able to have more influence on the ruling and media elites, who in turn have been able to take actions to favour the humanist opinion – thus strengthening R2. As R2 has come to dominate over R1, many more in power and in the media have jumped on the bandwagon making R2 stronger still. Thus it looks like Christianity in its traditional and Bible believing forms is heading for exclusion by an intolerant humanism promoting an ideology of diversity, equality and tolerance! Irony intended. Success to the successful, and the winner is humanism! A few things need to be remembered. 1. In many countries now, and in the past, Christianity has been excluded from the public stage. In fact that is where Christianity started and remained for 300 years. It survived, it grew, people were saved, God was glorified. 2. Most people are not ardent supporters of either Christianity or humanism and don’t express strong opinions. Thus they do not appear in the casual loop diagram above. Ideological battles are usually fought out by minorities. But over time people without strong views get attracted to one of the ideologies, usually to the nicer one. In the past Christianity won out over paganism because Christians treated people better. How we as Christians conduct ourselves in the current climate will be just as important as the things we say. Some of the current political correctness is really nasty and dictatorial, Christians must not respond in kind. 3. The call on the church is to make converts. If Christians put more effort into personal witness and seeking converts, and concern themselves less with changing the climate of society, then it will in time lead to an increase in the number of people following Christianity. This personal witness is a reinforcing loop, R3, increasing the most important variable – the number of Christian believers – those with opinion 1. See diagram below. Some of those converts will come from opinion 2 – the humanists, which will further weaken the hold of humanism on society R2. 4. We also need to remember that God is real, He created everything, controls everything and He is not in the business of losing! Christians take your confidence from Jesus, his power and his call, not from the climate of society. OK this is highly simplified and you may be able to think of all sorts of things to add to the diagrams, but hopefully it gives an indication of how system dynamics and systems thinking can give insight into current issues that affect the church. Sorry it is a bit rushed - but Christmas beckons - Alleluia! By “Christian” I mean the part of the Christian church that believes that beliefs, values and morality are revealed by God and are thus unchangeable. By Humanism I mean that these things are determined by people and can be changed from what they have been in the past. The contrast is whether the source of authority is God-centred or man centred. People do not fall neatly into the two fixed categories. Humanistic thinking pervades the Christian church and not just the “liberal” part. Politicians can defend Britain as a “Christian” country by claiming some of its values, even though they have on other occasions supported beliefs contrary to revealed Christian belief. See today’s Christmas message from the Prime Minister saying that we are a "Christian" country. But what he means by Christian may not mean what a Bible-believing Christian means. Labels are not a good guide to belief.